Without Lori, Shop Hopping is just not the same. But still fun. I had a chance to dash into 3 more stores last week for a short stop. My first stop was Broadbent's in Lehi. 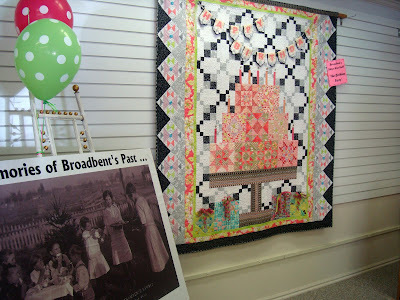 Broadbent's Quilting Chicks (their blog) are always fun to visit and ever helpful. I took a quilting question to Laurie and Laurel and of course they answered it fast. Thanks girls. 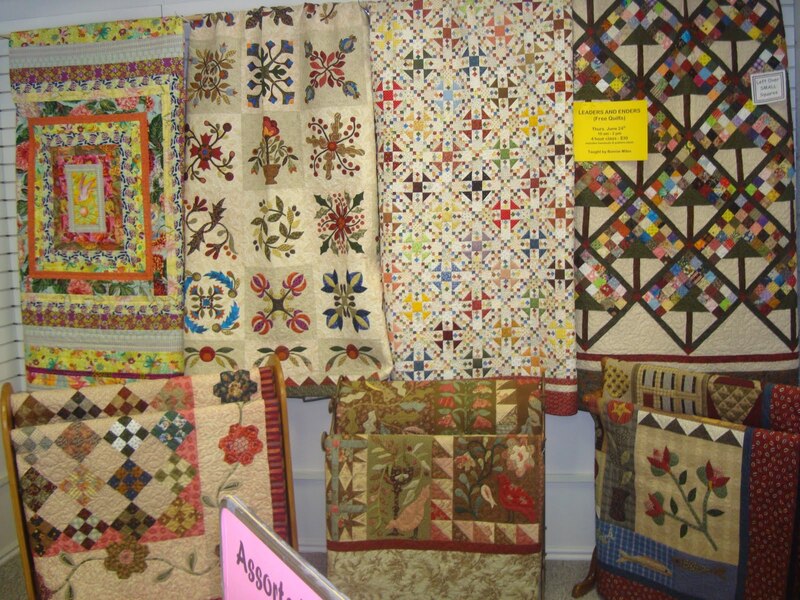 Their Shop Hop quilt (above) is spectacular. Designed by Janice and sewn by Laurel, this is one unbelievable quilt. Look at all the detail. Look at the tiny pieces in the boarder. It is so amazing! As you can tell they were celebrating birthdays. 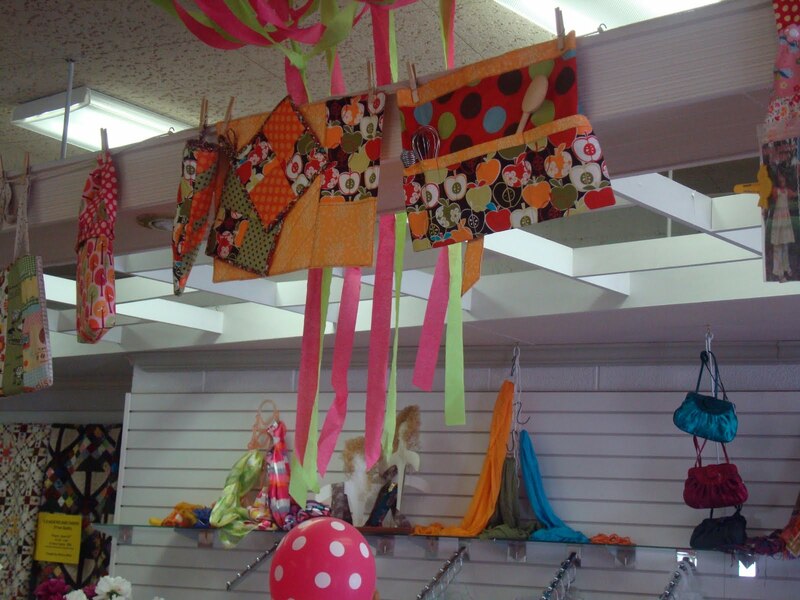 This corner of the shop showcases some of the amazing quilts made by the "chicks". They have so much talent there. 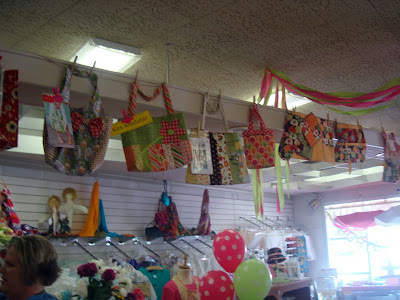 I loved the bags lining one side of the shop. They have Emily's quilt in the corner by the door right next to the birthday tree. All shoppers wrote down their names and birth dates and tagged the tree. I loved the little kitchen accessories hanging on the line above. As you can see, Broadbent's is also a General Store. 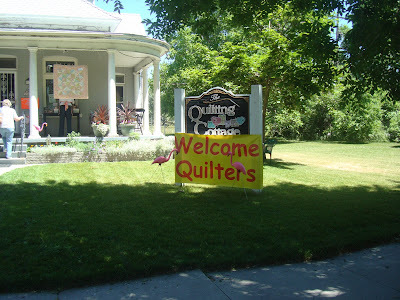 But I think their quilt shop and fabrics are some of the best in Utah. 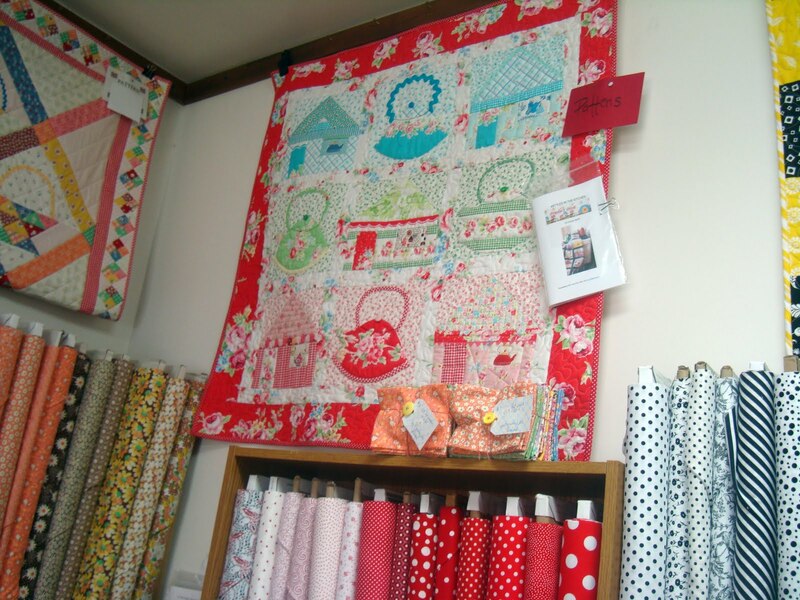 Next I went to see Suzanne, my old dear friend, at Quilting Cottage. Don't you love their welcome sign. 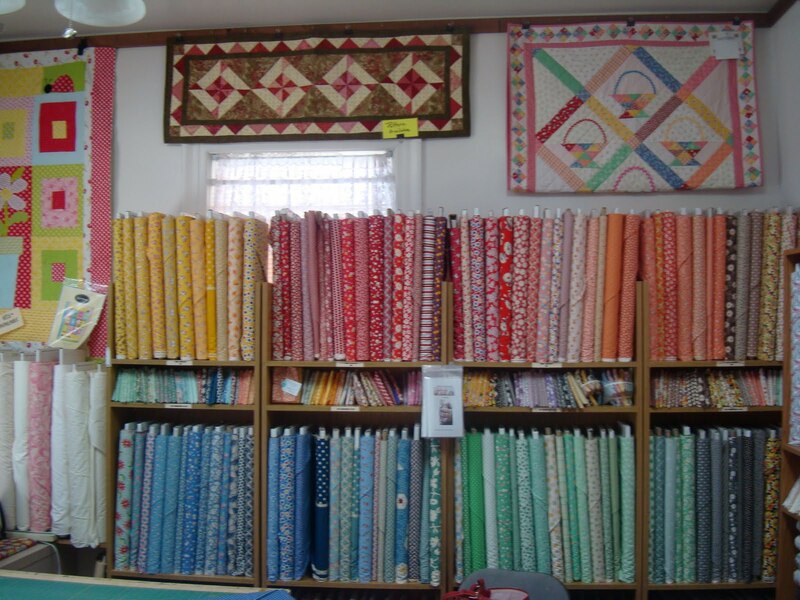 The thing I love the very most about Quilting Cottage is the selection of 30's. I never can leave without picking up at least a fat quarter or two. They have 30's I don't find anywhere else. 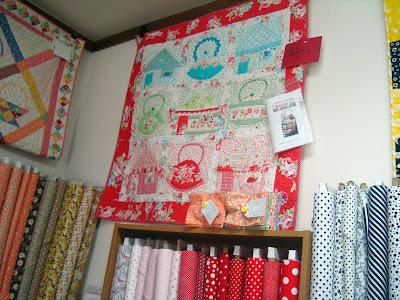 And it is always wonderful wonderful to enter a shop and see a quilt of mine hanging on the wall! I could tell they put a lot of work into getting the shop all ready for the Hoppers. Every display was cute and fresh. One more shop still to go! How I would love to see all those 30's fabrics!!! 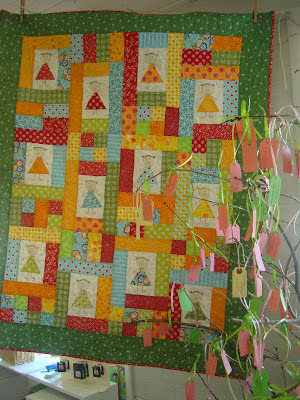 So fun to see all these pictures Nanette...love your quilt on the wall! Thanks for the plug. I've enjoyed shop hopping vicariously through you. With youth conference I was too tired to add shop hop to the schedule. Oh, how I would love to visit Broadbent's. It just sounds and looks like my kinda place. 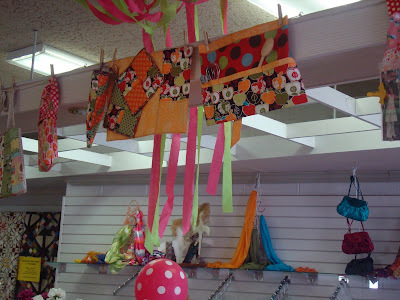 :-) Oh, wait, anyplace with fabric is "my kinda place!" LOL! Thanks for the great photos! That cake quilt in the first photo is absolutely super cute. Thanks for sharing! I went to Broadbent's on Saturday to pick up some Best Press. I loved their shop hop quilt. Those are some talented chicks! looks like so much fun. 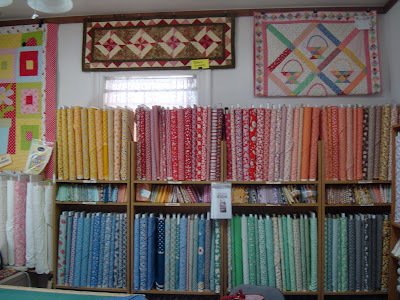 I have to decide which quilt shops to visit when I come out to Utah this summer! Oh, what fun and I just love your quilt and that big cake quilt. Lots more eye candy! Thanks for the mini-shop-hop we got right along with you. Nice shops! Looks like a fun shop hop, love the cake quilt and you're right the details in that quilt. Just Beautiful!! Love your basket quilt hanging there, very nice. I love your kettles in the kitchen quilt. It is so clever. Sounds like a fun shop hop. I did not see a photo of any purchases? Were you that good? 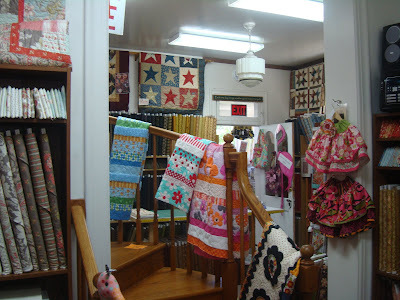 What a wonderful feeling to have as you enter a shop and see your quilt! Thank you for sharing your hop with us. I also love Emily's Quilt! You have a lot of inspiring quilt shops there! I'm envious! It's so great to see these pictures and to visit vicariously places I'll probably never be able to go. Thanks for sharing. Well, I didn't shop hop this time, so I'm glad to see your pictures of it! We're so blessed to have so many wonderful stores and quilters around here. thanks for taking all the wonderful pics - makes me jealous I couldn't attend!